The world is changing and so are the ways to new threats and cyber-attacks using the ever-growing and spreading technology. When you look at the role technology plays in a business, it’s not just to uphold and increase the productivity of the organizational process but also to secure the business in ways which help protect an organization from all cyber threat blows. According to the Center of Strategic and International Studies, cybercrime costs the global economy an approx. of US $400 billion per year. Another survey showed that the cost of cybercrime in the UK was more than £4 million for large organizations alone, rising steadily by 14% per year. In the current economy, businesses are prone to such threats on a daily basis, sabotaging the organization's structure internally and externally leaving them to face the destruction of trust and operational imbalance. Upon analyzing many users, companies, and institutions who are at risk of cyber threats, we found that many users don’t understand the idea of using a password manager. It is one of the best ways to protect, backup, and manage passwords diminishing the security risks to a huge extent. Given this analysis, EVC Ventures helped QuickLaunch, a cloud-based self-service Identity as a Service (IDaaS) platform, to create and set up a completely new Password Manager tool which could empower the users with self-serviceability. 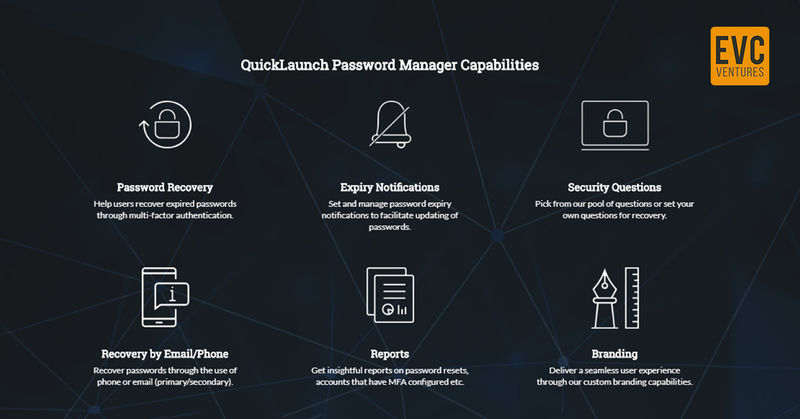 QuickLaunch password manager can also be linked to the single sign-on platform to help the users do away with the ordeal of having to call the IT helpdesk or remembering usernames and passwords. - Expiry Notifications: Admin can set and manage expiry notifications to help users facilitate the updation of their passwords. The notification keeps them informed and makes sure that the passwords are updated timely so as to protect them from any security risks. Changing passwords every now and then is a good practice and protects the system from any unauthorized break-in by hackers. - Password Recovery through MFA: This capability helps users to recover expired passwords using multi-factor authentication. 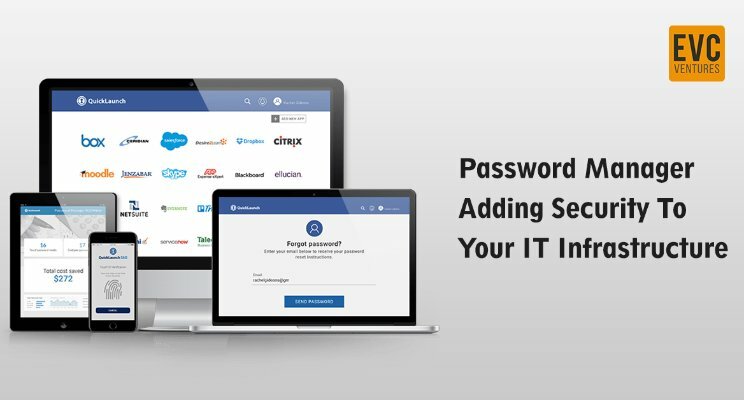 To recover expired or forgotten passwords, QuickLaunch Password Manager offers many options to the admin to enable different options depending on the user role. Security questions are set as a layer of authentication as well as a medium to recover expired or forgotten passwords. Recovery by email/phone is enabled by the administrator depending upon the usage and institutional policies on whether the user should be able to recover the passwords through just email or phone or both. - Flexible Recovery Options: Now users get to opt which options do they want in order to recover the lost, expired and forgotten passwords. They can enable or disable options for password recovery via security questions or email or phone. - Multiple Active Directory Support: Depending upon the institution's requirement, they can add multiple active directories and QuickLaunch password manager would seamlessly support them without any hassle. - Administrative Actions: If the admin changes the recovery options, users get instant notifications so they all stay on the same page. There are many password-cracking software out there which cycles through common patterns and known information of a user to crack the password which is why tools like Password Managers are one of the best ways to protect the enterprise and institutional security thereby creating a wall of security layers that the hackers would find difficult to break. Every day is a challenge to improve the company’s security awareness and reduce risk. Are you updated?